The ACTV-2 Block® is an active pickup module that comes standard on the Stick Bass® and is available as an option on the Stick® and Grand Stick®. It can also be installed on used 10 and 12-string Sticks with some widening of the diagonal channel in the instrument (contact us for more information on this option). The ACTV-2 comes equipped with a pair of active EMG stacked double coil pickups. They are hum canceling in design, but because of their short and narrow dimensions they have the laser pure sound of early Fender single coil pickups. The highs are cutting, yet carry weight, and the lows are musically rich and pronounced. 9. Damping shim for string balancing. The Block® pickup module is packed with features, including totally independent volume and tone controls on both bass and melody sides. It has a stereo-to-mono switch to move the melody side (high strings) from its own output to combine with the bass output ("tip" of the stereo cable). In mono mode either a mono guitar cable or the accessory Stick stereo cable can be used. The Block is constructed of a solid piece of machined black acetyl having the diagonal six sided, parallelogram shape of the standard Stick pickup housing, but elongated a bit in the direction of the strings to allow more room for electronics. This solid design fulfills the original conception of a diagonal pickup shape fitting inside of an elongated through-neck shape, started in 1974 with Stick No. 101. The Block locks into the thick of The Stick. The housing is machined with separate small cavities for each electronic component including buffer electronics and battery compartment. Both bass and melody pickups are adjustable for height, as is the entire module itself, which rides on four set screws from the bottom and thick rubber washers under the top two fastener screws. The Block is isolated from direct contact with the wooden instrument structure, and is detachable and replaceable with other pickup modules, thus preserving the modular concept of our Touchboard line of instruments. It is also reversible, the Block's shape being symmetrical relative to the strings. 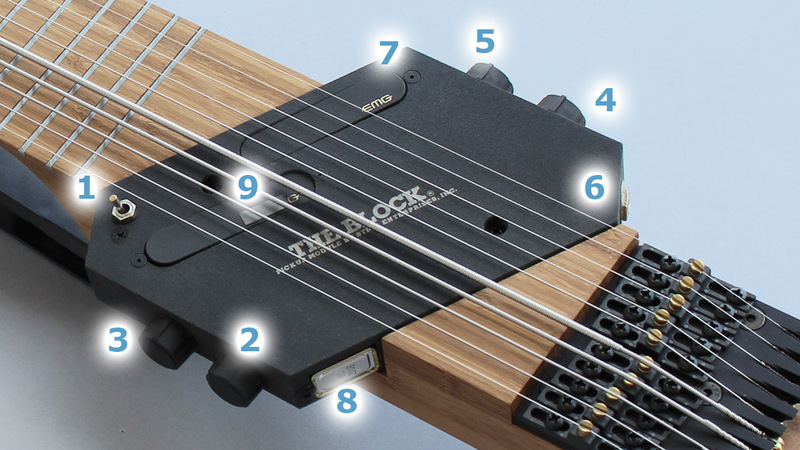 The pickups are toward the Block's inner edge and can be relocated from the "neck" position to a "bridge" position by simply sliding the module diagonally sideways out of its channel without disturbing the strings and refastening it in reversed position. Stick artist Greg Howard was the first to observe such reversible possibilities and has one installed in one of his 10-string Sticks, pickups at the reversed location by the bridge. Inside The Block are two trim pots on buffer circuits to set mono volumes of bass and melody sides independently. This allows you to separately adjust both pickup outputs in mono mode, thereby balancing volumes of bass and melody strings, and also to adjust the overall volume of mono relative to stereo modes. These internal trim pots are set at our shop for uniform volumes between string groups and modes. A single 9 volt battery slides into a recess from a vacant side of The Block without removing or adjusting anything else. You can leave it there for approximately 3000 hours of play. The battery automatically switches off when you unplug the cord. We offer the ACTV-2 active pickup module (The Block®) as an option on all new Stick models and as a retrofit to older instruments. Those Sticks with standard pickup modules (Stickups™) of earlier design must in addition have the pickup channel widened to accommodate the larger "Block" shape and size. By now, retrofitting The Block into older instruments has become routine work for us. See the price list for pricing details both with a new instrument and as a retrofit.